Halo fans will have to upgrade their computer if they want to follow Master Chief's adventures on the PC. Microsoft has announced that the PC version of Halo 2 will only work on the new version of Windows called Vista. The decision could make it expensive for many to play the game if they have to buy the new version of Windows and extra hardware for their PC. 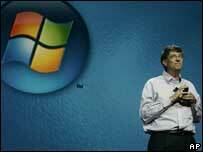 Microsoft has given no definite release date for Vista but it is expected to be available by the end of 2006. Deciding to make the best-selling Halo 2 Xbox game a Vista-only title is likely driven by Microsoft's desire to get people upgrading to the new version of the Windows. Minimum specifications for Vista (formerly called Longhorn) will be released in the summer but information gathered from reviews of pre-release versions have given clues about its hunger for computer power. With Vista, Microsoft has made big changes to the way it handles graphics. Unlike other versions of Windows, it will need an advanced video card to get the most out of it. It is also likely to demand a lot of computer memory and a sizeable hard drive. While these requirements are likely to be met by dedicated players who want to get the most out of games, many less keen players could struggle to comply. The decision to make only a Vista version of the best-selling Halo 2 game could significantly stunt the game's appeal. The Vista edition of Halo 2 will offer single and multi-player versions of the game, extra maps from add-on packs as well as software tools to create new places to play. To date Microsoft has sold more than 14.5 million copies of the Halo games. Players have also racked up more than 600 million hours of multiplayer Halo gaming on the Xbox Live service.